One of my best friends got married this August. I was in the wedding party. 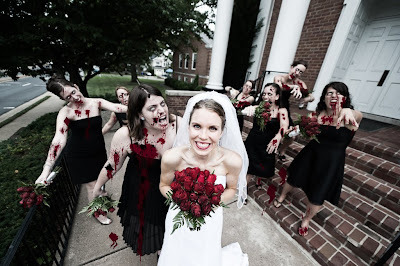 I may have instigated a zombie bridesmaids pose. The photographer might be a friend and might have gotten really excited about it. The results? Pretty freaking spectacular. Details: I'm to the immediate left of the bride. AKA, the head zombie. The photographer is Nathan Mitchell. Photos belong to him. He's awesome and hilarious. You should hire him if you have an event in the DC area. Remember, it's September Zombies month, and you can still enter to win my young adult zombie book giveaway. This is freaking awesome. 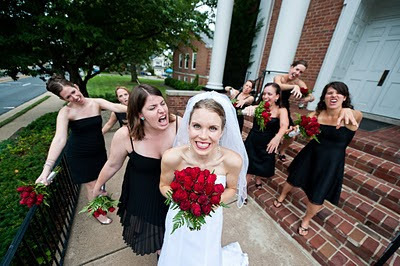 Best bridesmaid ever. Nice post!!! haha...what a great wedding! I love this so much I'm so jealous!!! My wedding was just alice in wonderland themed. I love the work done on that photo!! spectacular! While it creeps me out, I must say you look cute, play the part very well, and that photographer/editor is quite talented. It's amazing how creepy the special effects make that first photo!